Fireside Musing Loved it. Sarah at Library Hospital loved it. And now I can say that I also enjoyed it! It's cute, it's imaginative and yes, it's even magical. Now comes the time where I write a review of it. However, I went to read through Sarah's review of it (I had held off until reading it myself) and she has said anything I would have said so I'm going to point you over in her direction. 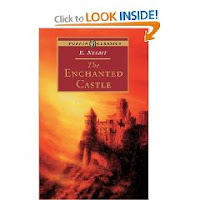 Here is the link to a really great review of The Enchanted Castle which includes some history surrounding the book as well as its cultural significance. Awesome job, Sarah. All I will add to her review is encouragement that you find a copy for you and your family to enjoy!